Tinker by New Working Group and Andy Dexterity is an intimate one-person show for young people that uses spoken word, physical theatre and Auslan (Australian Sign Language) to create an evocative, ambient, multi-sensory experience. Tinker's life is a quiet routine of nuts and bolts, tinkering and tankering, daydreaming and stargazing. From her attic window she only ever sees the world through the eye of a telescope. She images fantastical locations and remarkable adventures, but always from the safety of her home. When her life is turned upside down, Tinker must face her fears and, armed with only her imagination and creative thinking, head out into the world on a quest that will launch her into the stars. Tinker is an outsider's adventure story, a beautiful tale of heroism, curiosity, friendship and creativity. 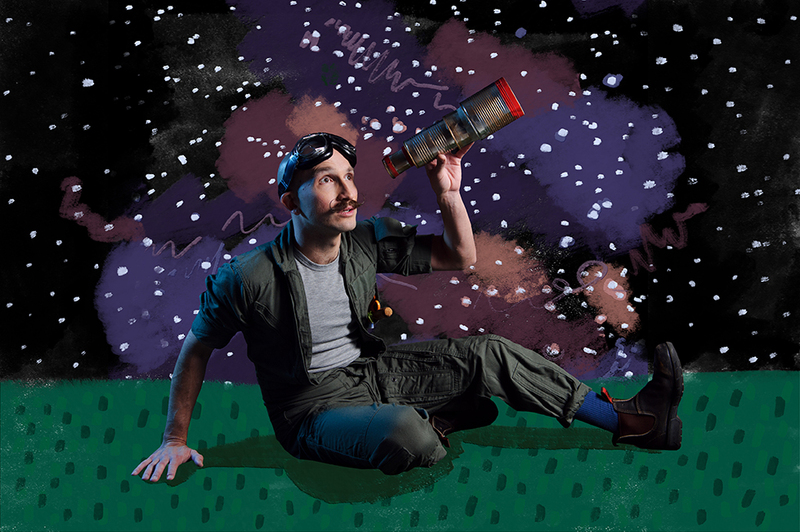 Tinker is a collaboration between Helpmann award-winning playwright Dan Giovannoni, and acclaimed physical performer and Deaf Australia ambassador Andy Dexterity. Incorporating the language of Auslan into physical performance styles, Tinker can be enjoyed by both Deaf and hearing audiences. Andy will play all the characters, as well as the narrator. Tinker uses old technology like cassette tapes, overhead projectors and record players to create an evocative, ambient, multi-sensory experience. Tinker is an investigation into creativity, imagination, and communication – our deep and enduring need to be understood. It is also a story about growing up. Our little protagonist embarks on a remarkable journey, one that will make her aware of her place in a much bigger world than she ever imagined. Tinker a meditation on growing up and the meeting place between childhood and adulthood.